You can now create your own custom furniture! This wooden storage set can be decorated to appeal to your very own style. It also fits perfectly in the Groovy Girls Hip Happenin’ House and sized to fit each doll. Furniture comes partially assembled; additional assembly required. Set includes: 8 easy-to-assemble wooden pieces, 4 glitterific pens, 10 perfect paint colors, 30 glamtastic gems, 1 super cool stencil and snazzy step-by-step instruction sheet. 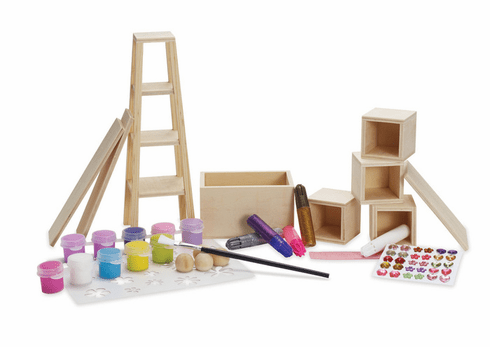 Paint, glitter and glamify your doll house furniture with the Stellar Storage Set!